Morrisons is launching vegan BBQ Jackfruit Mini Hot Dogs as the perfect summer banger. 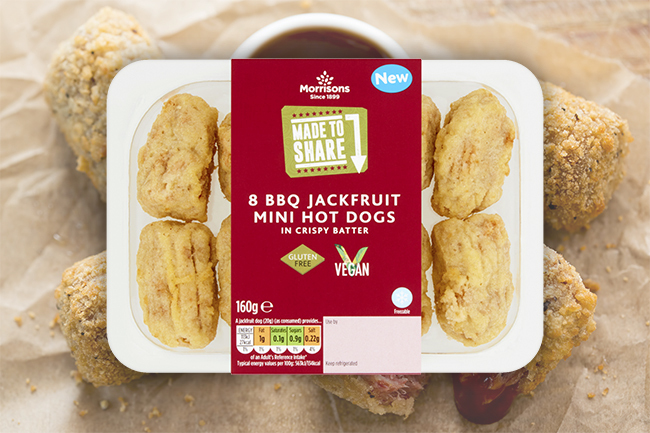 Hot on the heels of the launch of its No-Moozarella Dippers, UK supermarket chain Morrisons has announced another exciting addition to its vegan V Taste range – BBQ Jackfruit Mini Hot Dogs. The battered Mini Hot Dogs (RRP £2.50) are similar to corndogs; a fast food favourite from America. The filling of the Mini Hot Dogs is made from tender pulled jackfruit, which has been slowly braised in a smoky barbecue sauce and coated in a crispy gluten-free batter. Jackfruit has long been hailed as veganism’s best kept secret thanks to its shredded meat texture and ability to take on the flavours of the spices it’s cooked with. It’s also one of the most sustainable meat alternatives you can buy, as it grows easily in a variety of conditions.